Programs like Explorer and Directory Opus are at the mercy of the third-party components they load. This includes things like shell extensions and video codecs which may be added by other programs you have installed. When those third-party components go wrong they can cause crashes or memory leaks within the programs they are loaded into. 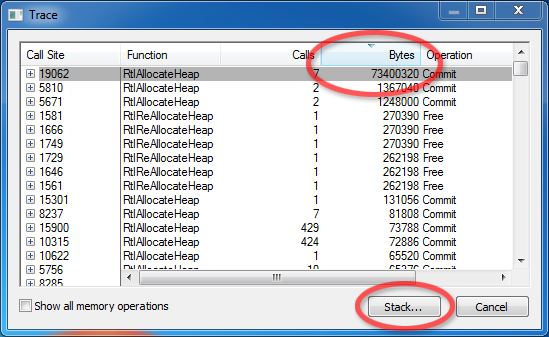 This post discusses a way to track down components causing memory leaks. A memory leak is when a program allocates memory and then doesn't give it back when it is no longer needed. The leaked memory is wasted because the program itself is no longer using it but nothing else can use it either until the program exits. High memory usage does not always mean there is a memory leak. If you are doing something that inherently needs a lot of memory, and that memory is given back when the operation completes, then that is not a memory leak. If you look using Task Manager it might say explorer.exe or dopus.exe are using a lot of memory but it won't tell you where the blame lies. There could be a bug in the programs themselves but it's almost always a third-party component. Here's how to find out which one. Download the free VMMap tool from Microsoft/SysInternals and extract its zip file somewhere. VMMap is a low-level debugging tool but don't worry, what we're going to do with it is quite simple. Double-click VMMap.exe and it should open a window with a list of running processes. 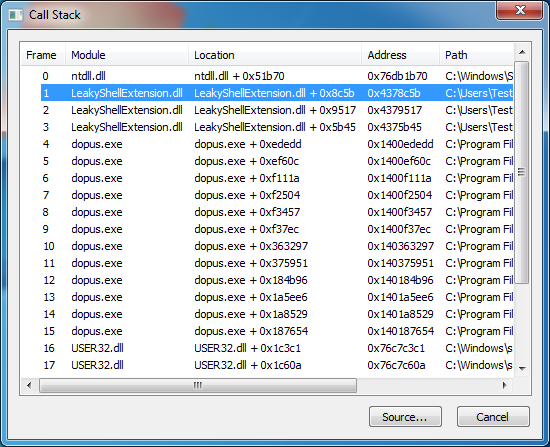 At the top of that window, click the Launch and trace a new process tab, then enter the path to dopus.exe, like below. Now click OK in VMMap; it should re-start Opus. Keep VMMap and Opus running; do not close either of them from now on. 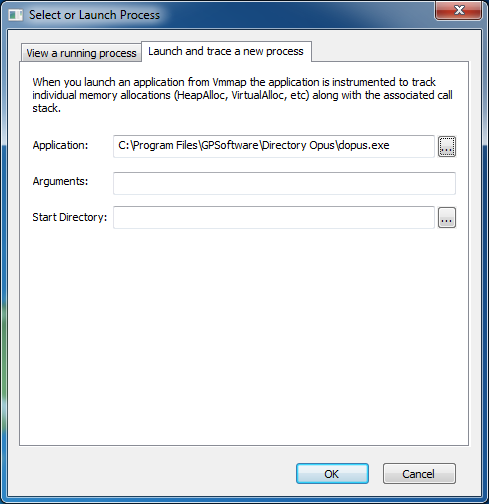 Use Directory Opus in a way which triggers your memory leak. Use the standard Task Manager to keep an eye on dopus.exe's memory usage so you can tell when you've triggered the leak. Return to VMMap and push F5 (or click View -> Refresh) to make it refresh. 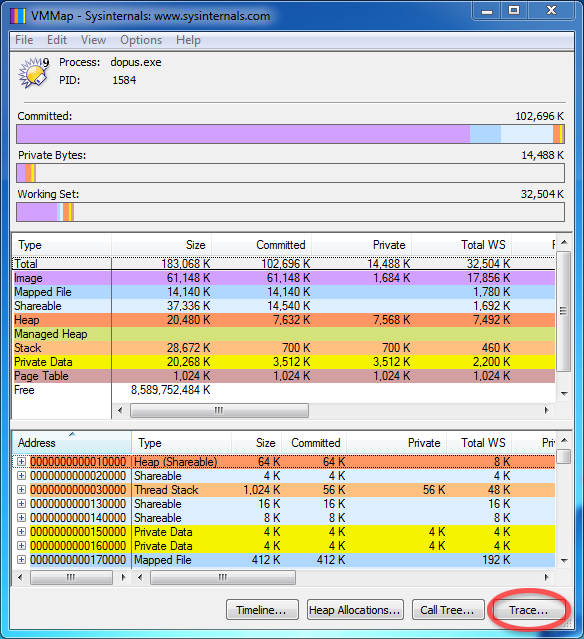 In the Trace window which appears, sort by the Bytes column and scroll to the top of the list. Select the first item and then click Stack... at the bottom of the Trace window. The component causing the memory leak is usually the first non-Windows DLL in the list. You can usually ignore the ones whose paths start with C:\Windows (e.g. ntdll.dll and user32.dll). In the example above, the memory leak was caused by LeakyShellExtension.dll which, as you can guess, is a shell extension I wrote for this guide which intentionally leaks memory. I wrote it to leak about 10MB each time a file was right-clicked and then right-clicked files a few times to make it leak about 70MB in total. Once you have a suspicious DLL the name and path are often enough to identify what it belongs to. If not, find the DLL on disk, right-click it, select Properties and then go to the Details tab. That will usually contain information about who made it and what it's a part of. Sometimes it's worth looking at some of the other DLLs in the list, too. Once you know what the DLL belongs to you can try uninstalling (or updating) it to see if the leak goes away. If the leak goes away then you know who to report the bug to. If the leak remains, repeat the process and see which DLLs are indicated. If it's the same DLL again then you know that you didn't successfully uninstall it. If it's another DLL, maybe the first one was innocent and can be reinstalled.